The usual Authoized Version rendering of (once of the North-Palestinian pronunciation). In the Revised Version "cypress" has been adopted in almost every case in the margin. Of the ancient versions the Vulgate almost in variably gives "Abies, ligna abiegna" (fir-tree), while the Septuagint and the Peshiṭta render it variously "cypress," pine," "juniper," "cedar," and "almond-tree." The translation "fir-tree" is strongly supported by the texts when studied in the light of Syrian flora. In the great majority of passages in which "berosh" occurs that tree is depicted as having its home in the higher regions of Mount Lebanon, where the cedar grows. This can not be said of the pine or of the cypress, these being trees peculiar to lower altitudes, and though they grow in Palestine and on Mount Lebanon, they are never seen in company with the cedar. On the other hand, there is in the subalpine and alpine zones of Mount Lebanon a species of fir-tree, the Abies Cilicica, which compares favorably both in height (130 feet) and in beauty with the cedar, its neighbor. Therefore the presumption is strong that whenever in the Old Testament "berosh" represents a tree or wood of Mount Lebanon the fir-tree is meant. In Hosea xiv. 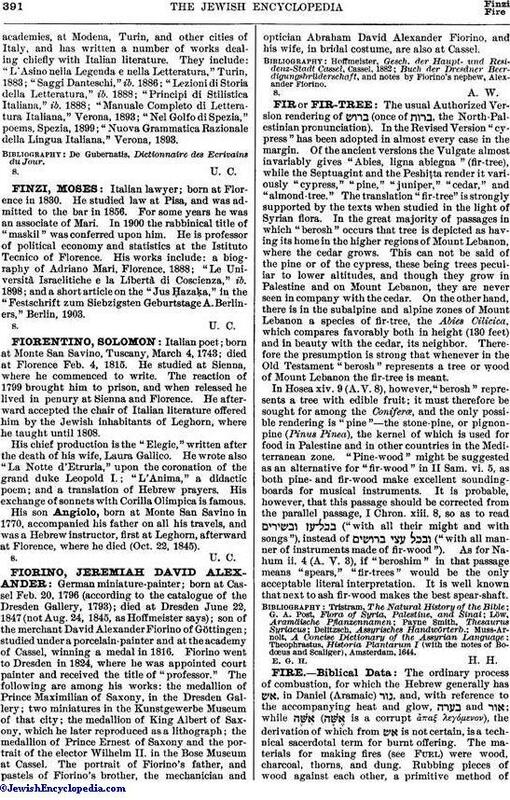 9 (A. V. 8), however, "berosh" represents a tree with edible fruit; it must therefore be sought for among the Coniferæ, and the only possible rendering is "pine"—the stone-pine, or pignon-pine (Pinus Pinea), the kernel of which is used for food in Palestine and in other countries in the Mediterranean zone. "Pine-wood" might be suggested as an alternative for "fir-wood" in II Sam. vi. 5, as both pine- and fir-wood make excellent sounding-boards for musical instruments. It is probable, however, that this passage should be corrected from the parallel passage, I Chron. xiii. 8, so as to read ("with all their might and with songs"), instead of ("with all manner of instruments made of fir-wood"). As for Nahum ii. 4 (A. V. 3), if "beroshim" in that passage means "spears," "fir-trees" would be the only acceptable literal interpretation. It is well known that next to ash fir-wood makes the best spear-shaft. Theophrastus, Historia Plantarum I (with the notes of Bodœus and Scaliger), Amsterdam, 1644.